Muse Challenge #121 contains an awesome card by the talented Michelle Ferguson, who blogs at I Card Everyone. Michelle's card has 3 white flowers with large blue circular centers and a very fresh and summery blue, white, and green palette. I fell in love with those colors. 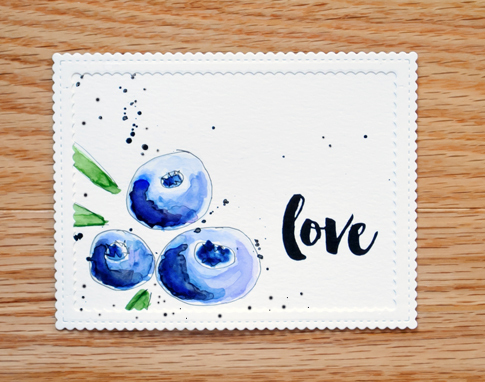 Since I'm fruit obsessed this summer, I saw blueberries and drew my own, adding a wonderfully scripted sentiment from Waltzingmouse. load up #6 paint brush with water and black paint and splatter. Hope for the best. Oh my gosh, I love this card so much! It jumped out at me in the MUSE gallery. I love blueberries too, but heavens, they have never looked this good!! You are so talented, and this is such an awesome take on Michele's muse. Wow! Fabulous job! I love the bold colors and the modern flair! LOVE this! I don't think you ever need to buy a fruit stamp again! Your drawing and watercoloring are wonderful!! Wonderful take on Michele's card,Joan! Love your hand drawn berries. Wow! You're seriously talented - I've been watching and enjoying your hand-drawn fruits! This is a fun take on Michelle's buttoned-up navy blossoms! So glad you joined us at Muse this week, Joan! WOW! This is amazing! Love this! Beautiful take on Michele's card and your water coloring is just amazing! You've found a real talent in yourself, Joan! Your drawing and watercoloring are fantastic! I, too, love these fresh, pretty colors. Beautiful card! Hooray for your drawing experiments! Gorgeous blueberries! Love them!!! Love your card!